Short, simple and delicious, this recipe makes a filling meal. A delicious recipe Cheesesteak Pizza - Topped with beef, onions , peppers, and cheese. 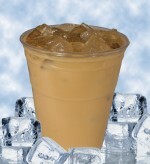 Refreshing Iced Coffee that made in minutes and quench your thirst for long time. The most perfect home made zesty Italian dressing. This is delicious on salads. Meatball sandwiches made with meatballs, marinara sauce, and any bread of your choice. This mustard sauce is fabulous! Easy enough for any night of the week. Great on sandwiches, fried chicken strips etc. Peanut chutney is a simple chutney and makes great accompainment to almost anything.